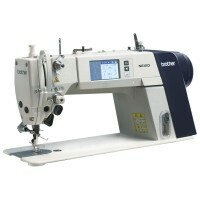 Brother S-7100DD-403 Direct Drive Lockstitch Industrial Sewing Machine with auto Foot Lift. Come and try it before you buy it. Brother has great quality machines for you, no matter what it is you sew. 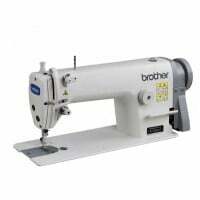 Brother machines are suitable for alteration shops, tailoring, curtain makers, fashion designers, sewing studios, factory’s, schools, colleges, bridal shops, dry cleaners and simply for your individual use. Brother has a wide range from basic to most advanced machines. Brother's brand new S-7100DD sewing machine with direct drive and automatic thread trimmer. A direct drive motor has been fitted on to the right-hand side of the sewing machine, with no drive belts, offering power savings over conventional sewing machine motors. Sealed oiling system with no oil in the sump to help reduce marking and staining of garments. Including a built-in LED needle light illuminating the sewing area. The S-7100DD incorporates a user-friendly operation panel on the machine head. 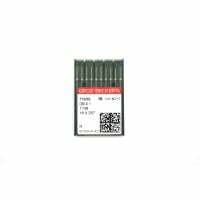 In addition to the often used start back-tack and end back-tack, other useful functions include program sewing and lower thread counter. The Brother developed direct drive motor and control box maximize the industrial sewing machines performance. 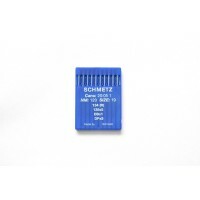 The electrical reliability has been increased and the sewing machine can now be used even in areas where the power supply is unstable. A top mounted bobbin winder is built in for easy winding and changeover of spare bobbins. The S7100DD-403, from Brother Industries Ltd, is the latest model with automatic thread trimmer and direct drive to go on Sale in the UK. A multi led "needle light" is provided, which is positioned to illuminate the needle and presser foot area.